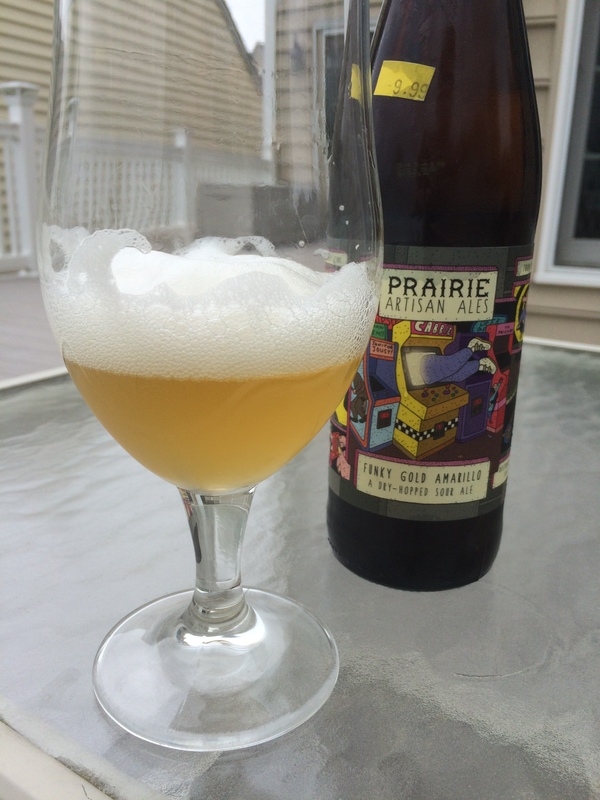 Brew Facts: The base beer for this one, Prairie Gold, uses ale and wine yeast as well as lacto and brett to funk it up. Funky Gold Amarillo furthers the funk by dry-hopping with Amarillo for some floral, spicy and citrus aromatics. Woo! There is also a version that uses Mosaic instead of Amarillo. Appearance: This pours a glass of champagne bubbles and a craggy head of fist-sized fluff that’s closer to dish detergent than beer. I recommend anyone without blasting equipment let it sit for about the time it takes to cook a Digiorno. Beyond the bubble thunderdome, the color is cloudy lemon mixed with pale yellow grain. When it calms, it has the look of a wheat beer mixed with a glass of Airborne. From my experience, cloudy is good. Aroma: A sniff finds lemon drop, musty grain, and bread. There’s a refreshing tingle of sour and funk with the slightest touch of metallic wafting through. If I hunt it down, I may pick up sulphur. Not a lot of distinct tropical hop aromas (some vague citrus), but another Funky Gold sampler mentioned a mild undercurrent of urinal cake (possibly from the floral qualities of the Amarillo) as it warms, so take that for what you will. Taste/Mouth Feel: After a gander and a sniff, it’s time to drink. The bubble fluff needs to be pushed aside to get a true taste, but the initial impression hints at a floral, tangy saison. As the frothy head suggested, the carbonation is front and center. Rolling it around the mouth has vinous, sour/iron on the front that pulls up with lemongrass and bread. The brett presence is strong but not overbearing and balanced by the lactobacillus. Surprising chest warmer for 7.5%, possibly due to the carbonation shooting the alcohol straight into your system. Even so, an airy beer that is both light in the mouth and flavorful on the tongue. Final Thoughts: I haven’t tried Prairie Gold to draw a comparison, but this dry-hopped version doesn’t revel in tart, saliva-sucking dryness or doses of heavy yeast that can plague some sour bretts. It’s a mildly complex summer drinker that’s worth keeping around for when the mood strikes. I could see returning to it when I want a refreshing sour hit without the sour bite. The gassiness and mid-range ABV keeps this from being a sessionable beer along the lines of a Gose, but a single bottle over an evening seems about right. Also, I recommend drinking this sucker cold for max enjoyment as it gets too loose as it warms (keep it tight!). It’s not a many-layered or intense beer, but $10 well spent on a tasty deck drinker. Recommendation: A good buy for the summer sour drinker.